Today I found this New Bolero Soap Line at Dollar Tree! I was super excited when I saw this deodorant at TJ Maxx for $3.99. Ive been wanting to try deodorant paste since seeing an episode of Shark Tank that featured a brand. I really like this deodorant. The smell is nice and goes away soon after application which i prefer. It comes with a small spatula that you use to put the paste on your fingers and then you apply to your underarms. 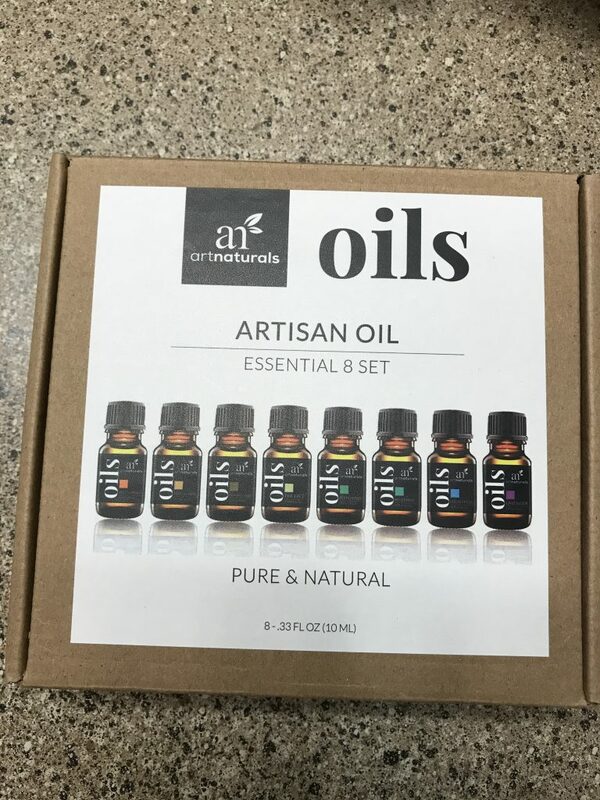 I recently decided I wanted to make my household cleaners with essential oils so I ordered this set of Amazon for around $15. I’m sure there are better brands out there, but for cleaning this should do the trick. I have been wanting to try this mask for a few years but never got around to ordering it on amazon. My husband and I went to an HEB (our local grocery store) a little farther away from our house and I found it for around $6. I love it. Since I am breastfeeding I cannot use a lot of acne fighting ingredients. 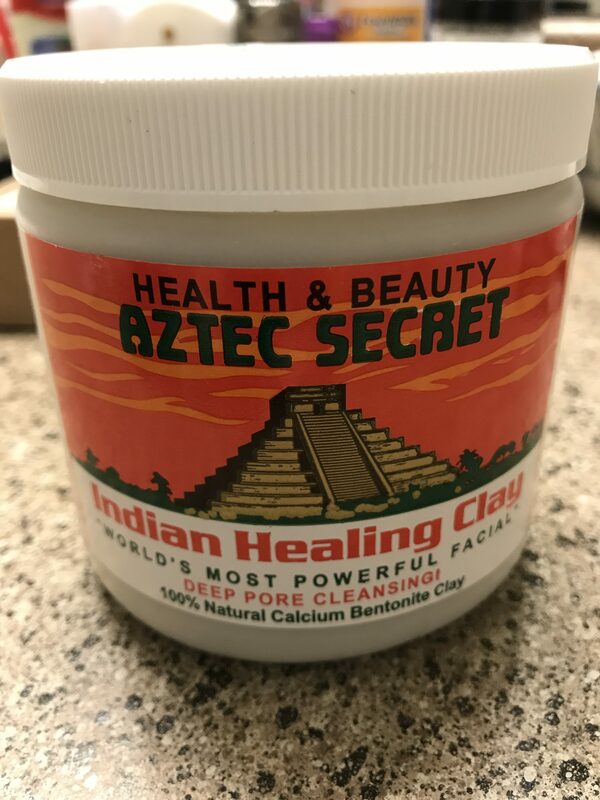 This really helps my skin stay clear. 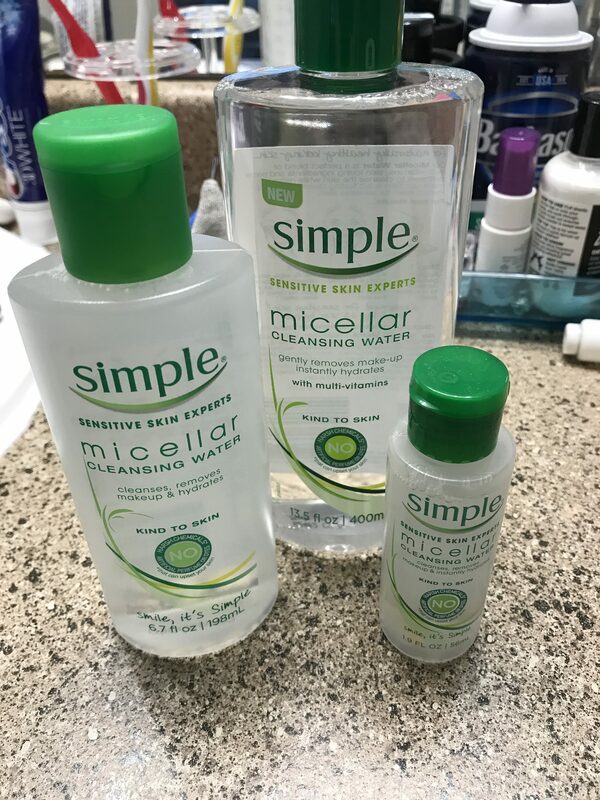 Since finding out the Garnier Miceller water had cancer causing chemicals in it I have been trying to find a replacement that is just as good. 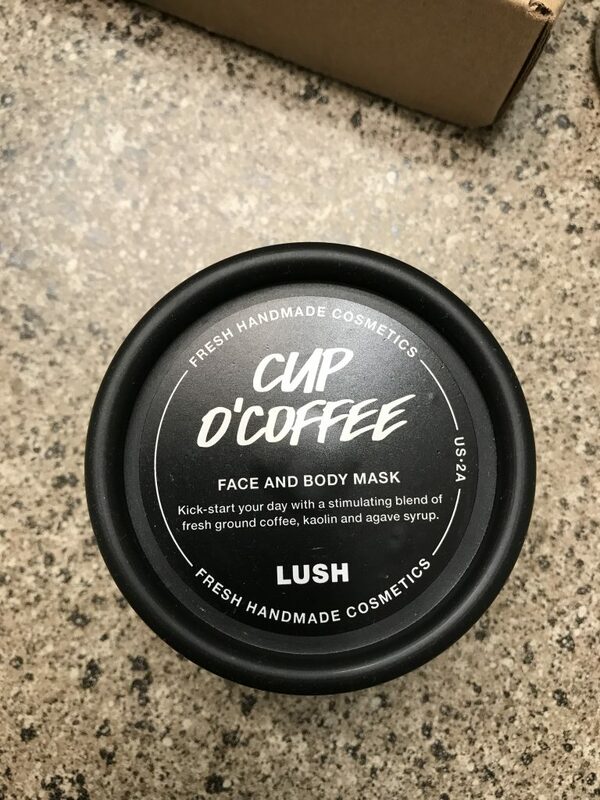 I picked this up today at Costco for $6.97 which is a good price considering the 6.7oz size would be at least that much at Target. I haven’t used it yet so I will update with my thoughts. These are a few new to me products I have purchased recently. I will do a followup post and let you all know how I feel about them! 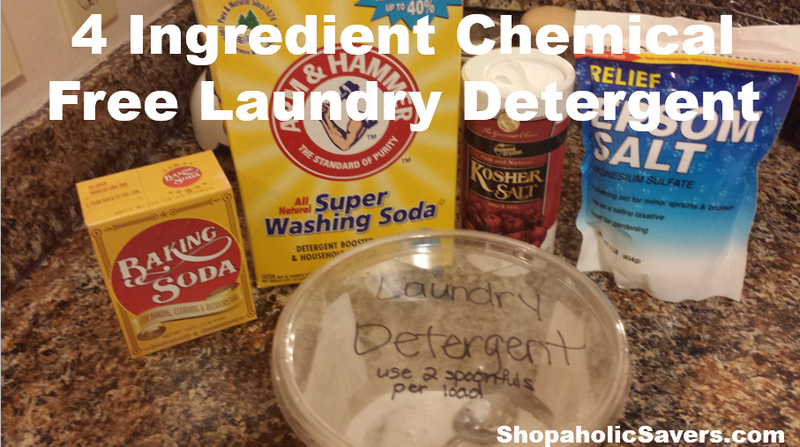 4 Ingredient, Dirt Cheap, No Cooking, Chemical Free, Laundry Detergent! 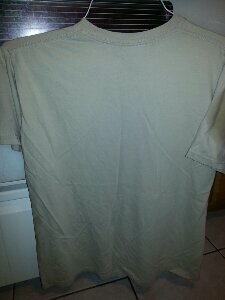 Laundry Detergent was one of the last items in my house to be replaced with a chemical free version. The main reason was because chemical free laundry detergent, like laundry detergent in general, is expensive. I also didn’t care to start making my own if it required cooking of any kind. For a long time I simply bought the concentrated $1 jugs from Dollar Tree. They aren’t bad but this recipe is better. 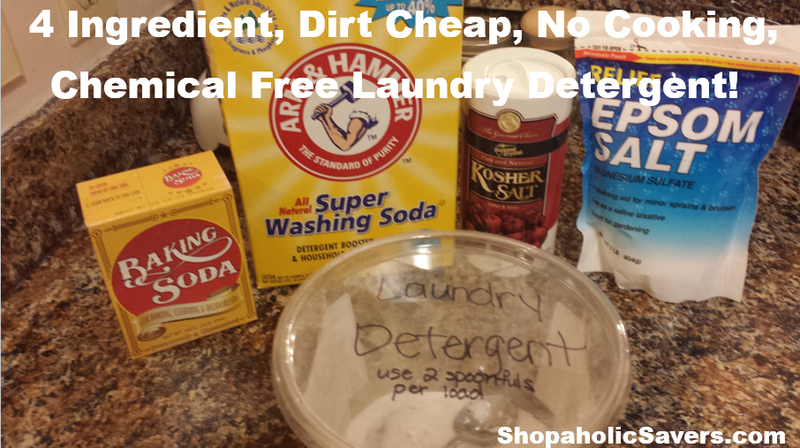 I couldn’t believe my luck when I found this Dirt Cheap, 4 Ingredient, Chemical Free Laundry Detergent. I was originally worried it might leave behind some powder or residue but it doesn’t. It just works great! Put all the ingredients in a container and mix them up. Use two heaping spoonfuls for a large load of wash. Use your best judgement for smaller loads. Thank you to Tatiana Amico for this recipe. My sister recently found these two four packs of Natural/Organic shampoo and conditioner at the body shop on clearance for $2 each! Just a reminder that Natural/Organic items go on clearance too even at more expensive shops like The Body Shop and it can’t hurt to look! 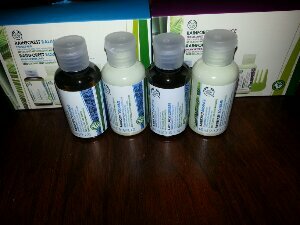 To find out more about my adventures in switching to Natural / Organic products click HERE. 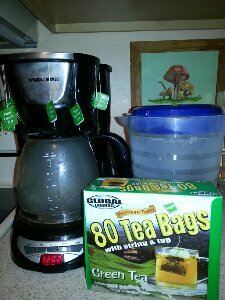 Recently we have started making our own Iced Green Tea. I tried buying some in the store but it was expensive and the first ingredient was High Fructose Corn Syrup which we try to avoid. So we ended up making it and it was really cheap and easy. That’s it and you have made your own green tea! We like this because we are trying to eat and drink healthy. 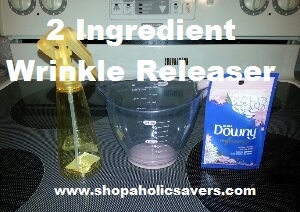 Saw It On Pinterest and Tried It- Homemade 2 Ingredient Downy Wrinkle Releaser- Can Be Natural/Organic! EDIT: I must report that after I posted this I discovered that you can literally just use a spray bottle with water to take wrinkles out of almost all clothing. I’m a college professor so I’m constantly spraying down business clothes and it works!!!! We LOVE Downy Wrinkle Releaser because it’s so much easier than ironing, especially while we are traveling. However, I became concerned about the chemicals that were in it that we were spraying all over ourselves. So when I found this recipe I was really excited to be able to make my own. 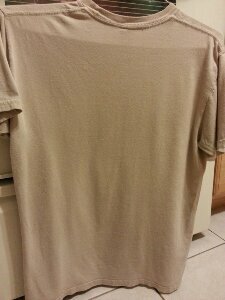 I happened to have a couple of free in the mail samples of fabric softener and I wanted to try making it for free before I buy natural/organic fabric softener to make it with. The single sample size portion you see in the photo above was large enough to make enough mix to fill the above spray bottle several times and I still have some left over. Thanks, TheMakeYourOwnZone for this pin on Pinterest that really works! If you have been reading about my Natural/Organic adventures and deals HERE then you already know that I have been replacing the cleaning and personal care products in my house with Chemical Free options. I wanted to find a good alternative to our hand soap especially because I often have dry, cracked skin on my hands and wash them a lot. I ended up purchasing Dr. Bronner’s Pure Castile Soap which is made from olive oil and I did a little research on how to turn it into hand soap. 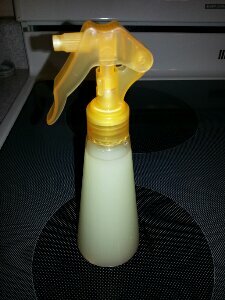 – Mix it in a foaming hand soap pump. This part is important because if you use a regular soap pump like I did at first it’s really runny and you will use more. However, it makes a great foaming hand soap. You do have the option of adding an essential oil for a different scent but I like the way the Almond Dr. Bronner’s soap smells so I don’t find that necessary. You can also add Tea Tree Oil to make the soap antibacterial but we didn’t use antibacterial soap before we went organic so we haven’t tried that yet. Click HERE to read about more of my Organic / Natural / Chemical Free adventures. Thanks, to MyMerryMessyLife for help with this recipe. At the beginning of 2012 I became more interested than ever in eliminating and removing chemicals from my home. You can read about that decision HERE. Since we are now well into 2013 I thought I should post an update. Towards the end of 2012 I really slacked off on this but I now have a couple of friends and my sister who are all excited about going chemical free and it has made me want to recommit myself to this lifestyle. It’s a lot more fun to have people to talk to about the stuff we make/buy and compare results. 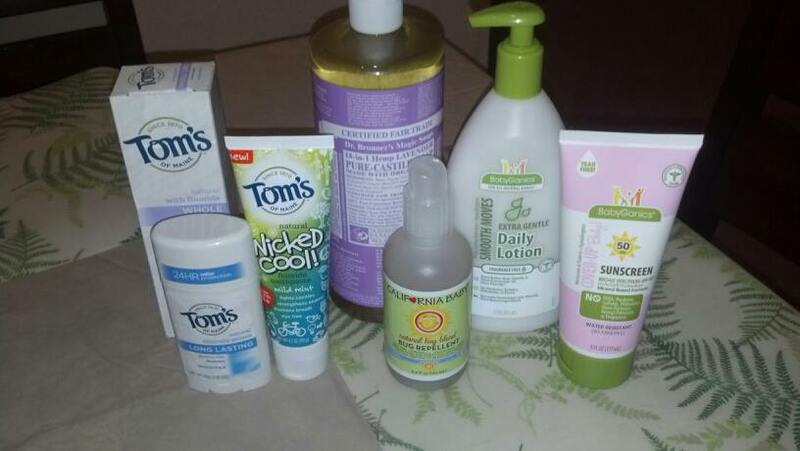 The picture above is actually some of the chemical free items a friend of mine recently bought for her home. 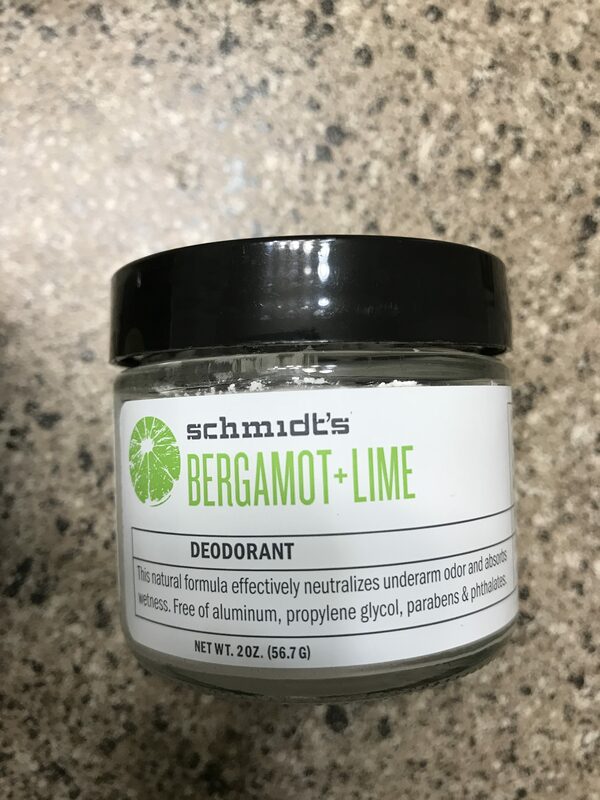 – I replaced my deodorant that contained aluminum with baking soda and then eventually with Tom’s of Maine Apricot deodorant. The baking soda worked really well but it wasn’t as convenient to apply a powder as it was to use a deodorant stick. – I replaced my toothpaste with Tom’s of Maine toothpaste and it actually helped me with the chronic canker sores I have gotten since I was a child. – I switched to a green cleaning spray and now switched to a spray bottle of vinegar that I use when cleaning around the house instead of Lysol or other chemicals. – I received a cast iron skillet from my brother for Christmas and I LOVE it! We use it all the time for cooking instead of Teflon. – We used vinegar to scrub the mold/mildew off of the walls and ceiling in our bathroom instead of something stronger and so far it has worked well. – We have stopped heating up anything in plastic in the microwave. – I made my own homemade weed killer out of vinegar and salt and it did work! – I also recently found The Environmental Working Group’s Cleaning Products search engine which allows you to search for your cleaning products and see how harmful they are on people and the environment. 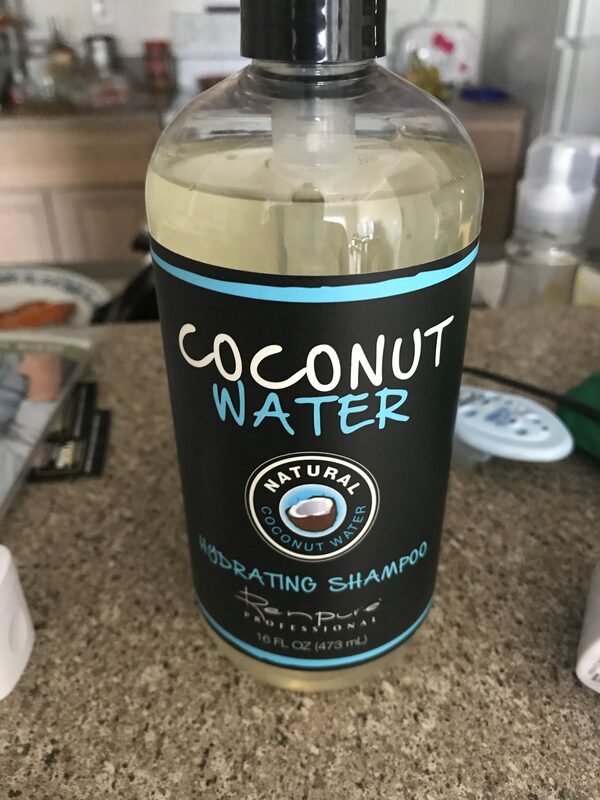 This just makes me want to throw away all of the non-chemical free products in our house, which I am slowly doing as I replace them with chemical free options. Edit– You can also go to The Environmental Working Groups Search Engine Skin Deep to search for all of your personal care products and makeup. I searched for all of the products I use frequently and I was in good shape except for my hand cream, which I now need to replace. – We have a couple of stoneware items to cook with which were very nice gifts. I should use these more often. – I got a great deal on some green works cleaning spray and I used it for about half a year and I liked it a lot. Now I have switched to vinegar which is cheaper and even more chemical free. – We tried organic coffee and rainforest certified coffee this year and we liked it a lot but I can’t say we noticed a difference from regular coffee. It is just so much more expensive that we haven’t continued buying it unless we get really great deals on it. – I got a good deal on Method dish soap at target after coupons and I tried the cucumber melon scent and I loved it. I didn’t have as good of luck with other Method products though. However, I have had good luck recently getting dish soap for free so I found it hard to justify buying natural dish soap. If I have to buy more then I can see buying natural/organic dish soap if I can get it for cheaper. Also apparently Method products aren’t rated very well as far as green products go. – I was excited to get Botanical cleaning wipes for free at Winn-Dixie and they work but unfortunately they smell so strongly and strangely that it makes me not want to use them. But we do use them on occasion. – I thought that the Physician’s Formula Organic mascara we tried worked well but when my eyes watered it burned my eyes in a way that my non-organic mascara never did. -I tried natural motion sickness medicine. It did seem to help a little bit but just not as much as Dramamine. I did however find that ginger chews seemed to help for shorter trips. – I used vinegar and baking soda to clean our toilet and it actually worked really well except for around the bottom flush area. So this result was mixed. – I was able to buy Yes to Tomatoes shampoo and conditioner at Walgreens on sale for about $2 each, which is really cheap for Organic/Natural personal care products, but every time I used them they gave me a really bad headache. I ended up giving them to another family member that wasn’t bothered by them. – I got some free Yes to Carrots hand cream after a coupon. It burned my chapped hands and turned them red. I ended up getting rid of it. I haven’t had good luck with the Yes To brand of products so far. I don’t know if I will buy any more. – I bought some Method Laundry detergent and cleaning spray right around the time that I broke out in horrible full body hives. I can’t say for sure that either of these items contributed to the hives but I just can’t be sure so I got rid of both of them. Also. as I mentioned before. apparently Method products aren’t rated very well as far as green products go. – We have really liked most of the Organic/Natural food products we have tried but we find them to be a lot more expensive than regular food products. We still buy them when we find good deals but it would be impossible to stick to our $200 a month grocery budget if we only bought Natural/Organic foods. – We have bought some glass food storage containers but I wish we had more. They are just a lot more expensive than our stockpile of plastic food containers that were mostly free. 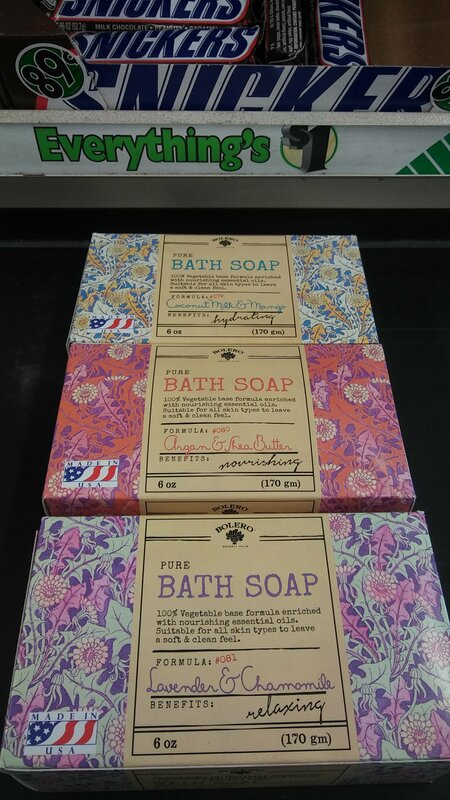 – I purchased Dr Bronner’s castile soap and I’m hoping to use it to make cleaning and household products. 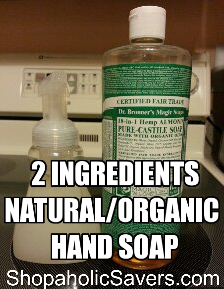 – I already used the Dr Bronner’s castile soap to make 2 ingredient hand soap which is supposed to be a lot less harsh on my always chapped hands. So far so good. We have had great luck with turning this into foaming hand soap that we now use all over our house. Click HERE for the recipe. 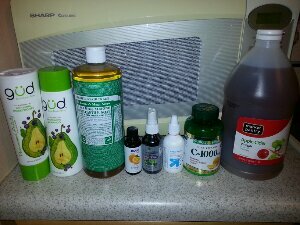 – I have also been sick and haven’t had any luck with antibiotics so I’ve decided to try some natural medicine, saline spray, vitamin C and apple cider vinegar. I’m actually feeling a lot better, but I had already been sick for a while by the time I started it so it’s hard to say if the virus just ran its course. I actually do think that the natural medicine helped because I was still really sick when I started with it. Edit– I am now entirely better in about 4 days after almost two weeks of being sick. Next time I get sick I’m going to start this right away to see if I get healthy faster. – I just bought some Gud (by Burt’s Bees) natural shampoo and conditioner and hopefully I will have better luck with that than I did with the Yes to Tomatoes products. So far so good and it smells excellent. Edit– I don’t think the conditioner is as good as the non-natural but it still works. – Our garden is still in the early stages but I’m hoping we will be able to get some nice veggies out of it. – I made some baking soda body wash (mix baking soda and water until moist) this morning but I haven’t been able to try it yet. Edit– It works great so far! 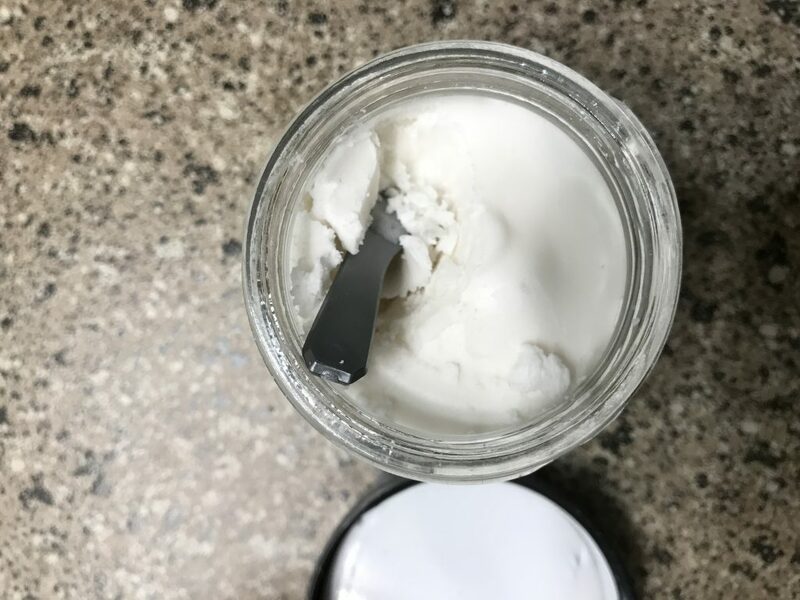 – I would really like to try making my own natural hand cream but this seems to require more cooking and ingredients than some of the simple recipes I’ve tried so I’m going to keep looking until I find a recipe that I really like before I attempt it. – I bought some essential oils to use instead of perfume (which is full of chemicals) but I’ve been so sick I haven’t tried it yet. 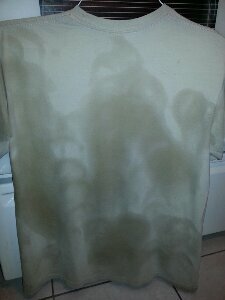 – We also figured out how to make natural/organic downy wrinkle releaser. Click HERE to see how. If you are interested in seeing my Natural / Organic and Chemical Free adventures in the coming year click HERE or simply click on the Organic / Natural tab in the top navigation bar. 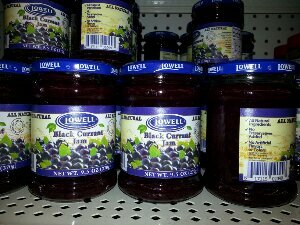 I was at my local Dollar Tree the other day and found this Lowell All Natural Black Currant Jam. Dollar Tree sometimes has close out items from other stores so I’m not sure if this is something they will regularly carry or not. I have noticed that items like this tend to go fast. We try to buy Organic/Natural products when we can and the last jar of Organic jam we bought was $3-4 so at $1 this is a good price. We Finally Planted Our Garden! I know it doesn’t look like much yet but we are very excited that we have finally planted our garden! We planted a variety of vegetables and flowers in organic soil so here’s hoping something grows! I would love to be able to eat some veggies we grew ourselves, especially since we will know that they won’t have been sprayed with chemicals. 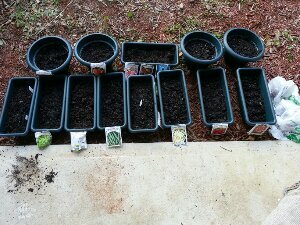 I bought all of the pots and planting boxes from Dollar Tree for $1 each, I bought a huge bag of organic potting soil from Big Lots for $8, and the seeds were 4 or 5 packs for $1 on sale. My aunt also gave us a bag of her Marigold seed so I’m really hopping those will grow. I will post an update on the garden soon! After we finished gardening we rode our bikes around our neighborhood and enjoyed the coolish Florida weather. The we went to the movies to see Iron Man 3. We used a movie gift card I had won at work so our tickets were free. Overall, we had a really frugal, fun day! Swagbucks Sponsored Post: Get 300 bonus SB when you sign up for Swagbucks in January! Swagbucks Sponsored Post: Earn BIG with Coupons! 11-1-18 A Few Frugal Things- We adopted a puppy! Get 300 bonus SB when you sign up for Swagbucks in November!